Friday 17th July – Providence, Guyana: A phenomenal bowling spell from Sunil Narine, for the Guyana Amazon Warriors, helped them to victory against the St Lucia Zouks in the Hero Caribbean Premier League. His four overs cost just six runs as he once again proved why he is the most sought after spinner in Twenty20 cricket. Having been set 112 to win, the Amazon Warriors made hard word of getting there as they reached their victory target with three wickets and 12 balls in hand, with Denesh Ramdin seeing them home with 39 not out. The Zouks batted first and the bowler that looked most likely to break their prolific opening partnership appeared to be left-arm spinner, Veersammy Permaul. He almost had Andre Fletcher dismissed stumped with the second ball of the match and had an incredibly close LBW shout against Johnson Charles turned down. Charles could not make the most of his apparent good fortune, he was bowled by David Wiese for 11 (9). Although it was the South African quick bowler that got that first breakthrough, it was Permaul that was causing the most issues for the batsman as he varied his pace beautifully to keep the opposition guessing. He completed his full allocation of four overs in that opening spell, claiming figures of 1-17 in the process. The Zouks made it to 43-1 at the end of the Powerplay, but they should have been two wickets down. Pietersen smashed the ball straight to Umar Akmal in the covers only for the Pakistani international to drop a very simple chance. Pietersen was on 16 at the time. Sunil Narine was introduced into the attack in the seventh over and he was in the wickets straight away as he completely changed the complexion of the innings. He dismissed Fletcher LBW with a top spinner that shot on to the batsman. Delorn Johnson was promoted up the order as a left-handed pinch-hitter. The experiment lasted one ball, Johnson going for a golden duck when he smashed his first ball straight up in the air. Narine continued the wicket taking in his next over when he got another LBW, this time it was the Zouks' captain, Pietersen, that was trapped in front of his stumps for 24. The spinner was unplayable on a Providence pitch that took real turn. After two overs he had taken three wickets for just one run. He finished with 3-6 in a spell that included 18 dot balls. The spinners terrorised the Zouks throughout their innings, with even the part time tweakers of Brad Hodge claiming the wicket of Kyle Mayers. The St Lucians managed only two boundaries between the sixth and 17th over as the spinners completely tied down their opponents. A partnership of 43 between Ross Taylor and Henry Davids gave the Zouks total some respectability as they made it to 111-7, but it was never going to be enough. The first two overs were a perfect start for the Amazon Warriors as they made it to 19 without loss, but a wicket maiden in Johnson's first over brought the Zouks back into things. 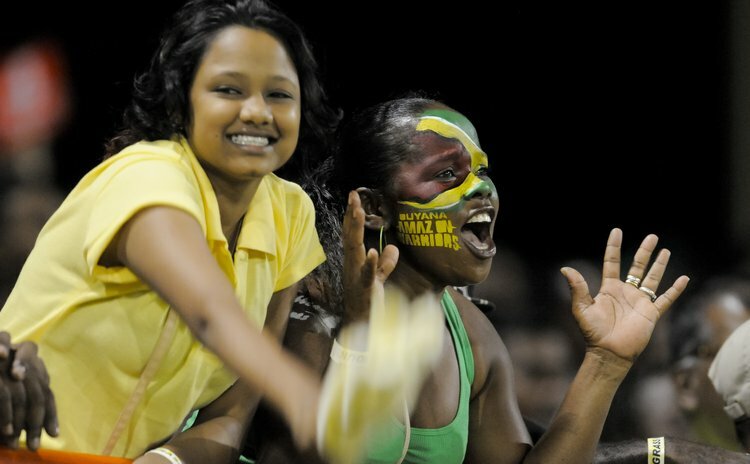 The Guyanese side had made it to 47-1 off their Powerplay overs. Just as Narine had done so for the Amazon Warriors, Keron Cottoy made a massive difference as he recorded career best figures of 4-18. A change of ball, as a result of dew soaking the innings began with, led to an immediate change in momentum as Cottoy picked up the wickets of Simmons and Brad Hodge in the space of three balls. Things got even more interesting when the young leg spinner dismissed Umar Akmal LBW, but a big inside edge should have saved the batsman. Cottoy's contribution became even more telling when he bowled Christopher Barnwell for seven with a full ball that the batsman missed while trying to play an expansive drive. In the same over Wiese was run out for a duck going for a single that wasn't there. A further run out saw the Amazon Warriors loose six wickets for 18 runs to leave them 83-7. As the Zouks looked around for spin options, Pietersen turned to Fletcher for his first ever over in Twenty20 cricket. The Zouks just did not have enough runs to defend, but they fought brilliantly until the end. A Permaul six sealed the win in a thrilling match that was enjoyed by a big crowd in Providence as he and his skipper saw their team home. This win takes the Amazon Warriors to second place in the table, and, with two home games remaining, they are well placed to make the latter stages of the event, conceivably as table toppers going straight to the final.